In the bottom set (b), the two faces are swapped. This can be useful for home use. 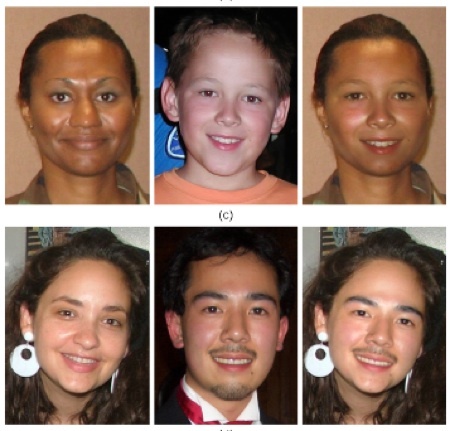 Instead of swapping from a library of random strangers, the software can substitute faces taken from a set of images taken at about the same time. So if you are taking pictures at a birthday party of a group of restless children the software can swap their faces with versions of themselves with better or different expressions (smiles, no red eye) until you get a group picture you like (no one blinking). Systems such as Google Street View and EveryScape allow users to interactively navigate through panoramic images of public places created using thousands of photographs. Many of the images contain people who have not consented to be photographed, much less to have these photographs publicly viewable. Identity protection by obfuscating the face regions in the acquired photographs using blurring, pixelation, or simply covering them with black pixels is often undesirable as it diminishes the visual appeal of the image. 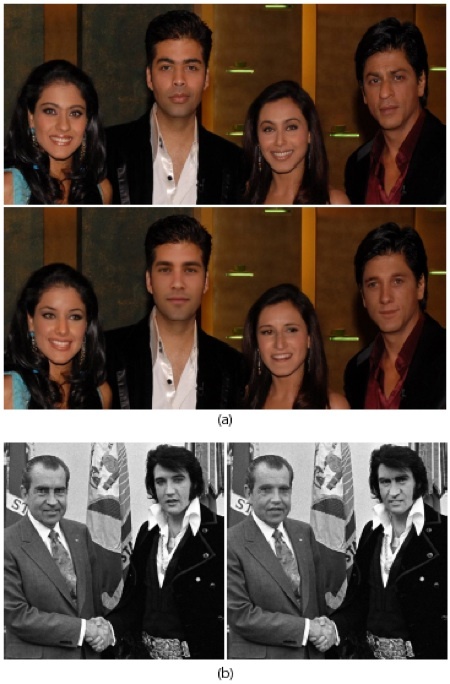 Furthermore, many of these methods are currently applied manually, on an image-byimage basis. Since the number of images being captured is growing rapidly, any manual approach will soon be intractable. We believe that an attractive solution to the privacy problem is to remove the identities of people in photographs by automatically replacing their faces with ones from a collection of stock images. This is cool and innovative, but SO WEIRD.